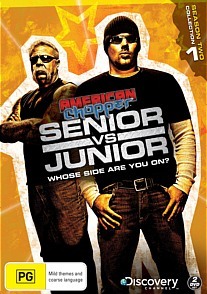 American Chopper Senior vs Junior Season Two Collection 1 DVD Review. This is great viewing that is well worth grabbing even if you are not a fan of motorbikes. Paul Sr and Jr go head to head in this series as they go their separate ways with two companies putting out very similar yet very different products. Whilst I'm not sure why this has happened, it does make for some high drama. The name of the game is, as it should be, making motor bikes and both companies do an exceptional job at this. Each motorcycle is a genuine work of art in its own right and look so good that I would bet that the owners must often worry about damaging the amazing paint jobs that they have on their bikes. The way the two different shops operate are poles apart but both produce great results. There is a lot of nonsense of the part of both Pauls, with Sr seemingly easily manipulated by anyone trying to talk trash about his son. Lawsuits are raised and I must confess that it's the part of the series I have no interest in, even though I know that it adds to the whole drama of it all. I guess I just want to see bikes built by masters at what they do and they give us that all day long. The way the show is put together makes for highly enjoyable viewing, they never linger too long on any one part of the production of a bike, instead jumping around from bit to bit as the machines come together. I am utterly amazed every episode, I am not sure though how much of the Tuetel drama and lawsuits are scripted as in the fourth episode when brother Michael is having his art show, there is a sequence between Paul Sr. and his wife that I refuse to believe is a real interaction between the two of them. It is the most stunted exchange I’ve almost ever seen on a “reality” television show. It was laughable and sort of made me feel that maybe there are outside influences pushing the show along. My favourite parts of this show other than watching just how clever these men are in putting together their machines are the rare occasions that you get to see one of the bikes actually being ridden on the road. It’s amazing to see them used in a real life setting and for me symbolised more what the show should be about, rather than show pieces that will never really see the light of day. This is great viewing that is well worth grabbing even if you are not a fan of motorbikes. These men are great artisans, bending metal to their will and making machines that are both functional and also can be seen on their own merits for what they are: works of art.